I love Mediterranean food! There something so delicious about simple ingredients working together to make a nutritious and filling meal. 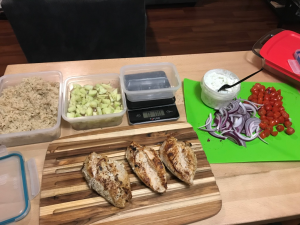 When it comes to meal prepping, I have a tendency to get stuck in the familiar and make the same thing every week, e.g. sweet potatoes, chicken, broccoli, rice and brussels sprouts. To break the routine one week, I decided I would go Greek! Step one is to marinate your chicken. 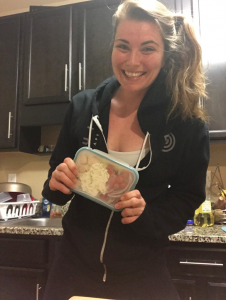 The recipe calls for ¼ cup of olive oil, but you are more than welcome to adjust that to fit your macros! -Combine all ingredients in a gallon ziplock bag, and forget about it for 30 minutes or up to 12 hours. 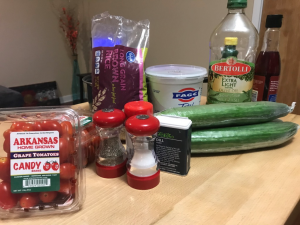 -If you’re good at multitasking,I suggest cooking your rice and making the cucumber salad and tzatziki while the chicken is marinating. -Prepare rice according to package or your rice cooker. Prepare cucumber salad by slicing and dicing your cucumbers, adding some vinegar, oil, spices and throwing it in a bowl.. Easy! I love this sauce because it makes me feel like I am eating something unhealthy for me and really, I am topping off my meal with a little more protein and some healthy fats! Fun fact: I also use plain 0% yogurt as a replacement in meals… ALL THE TIME. The tart creaminess can mimic that of sour cream, and when added to Ms. Dash Garlic Herb season it can pass as a ranch dressing. Make this sauce by combining the below ingredients, store in the fridge until you are ready to assemble your bowls. The last step is to half your cherry tomatoes and cut your red onion. These are additional flavor boosters to top off your bowl. This is really a garnish so onion and tomato are optional but they really do make your bowl look quite fancy! I split this recipe into 6 servings or 6 bowls. Depending on your macronutrient needs for that day feel free to adjust the amount and serving sizes. 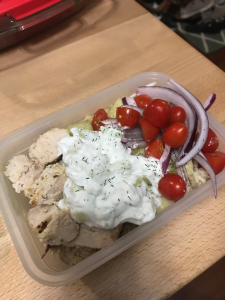 If you are going to have bowls that vary in amounts of rice, chicken or tzatziki sauce, I would manually enter each item separately into MyFitnessPal. The nutrition facts below are based off all the ingredients together. I love having these for lunch in the summer. They’re tasty warmed up or cold! It is a great way to liven up your standard staple of chicken and rice!